After few changes to the manual transmission for half a century, all of a sudden there are new and significant updates to the transmission some love, some fear, and most never even think about. The big change to manuals is that they can now match revs on downshifts. To more than 95% of automobile drivers and owners this is a concept they neither understand, nor care about. However, for the remaining few who do enjoy selecting their own gears the old fashioned way, this technology might be the savior for the stick shift transmission. Like adjusting a manual choke, properly shifting a manual takes some study, some understanding, and lots of practice. For nearly everyone, the advent of the automatic choke was a welcome relief. This is also true of the automatic transmission. Once it became available most drivers chose it, even though manufacturers charged significantly more money for it. So many people chose it, and so few chose the manual, that most new cars don’t come with the option of a manual anymore. There are really two categories of automobiles that still offer manual transmissions. The first is economy cars that are underpowered. Although the cars are not made faster by having a stick shift, the constant rowing of gears distracts some from the fact they are driving a slow car. Some see this as fun. Most don’t. Then there are the sporty cars, whether they be sport sedans, coupes, or roadsters. In these vehicles, manufacturers offer manual transmissions for two reasons. First, there are a small handful of buyers who are enthusiasts and they want the manual transmission, and they will indeed seek out the models with the manual and buy the car. Second, there are enthusiasts who like to think they might buy a manual transmission, and they want to try it out at the dealership on a test drive. However, after they do they realize this is also the car they will often drive to work in traffic. They buy the automatic, but manufacturers know that had they not had the possibility of a manual, that buyers might have gone elsewhere. A great example of this was the IS sports sedan offered by Lexus. The IS250 was an underpowered car that was available with a stick shift. The IS350 was a powerful and fast sports sedan with only an automatic transmission. For many years the IS250 was available with a stick shift and countless reviews by enthusiasts at car publications said that they liked the IS350, but for them being able to manually shift gears was so important they would choose the IS250. All 9 of them were telling the God’s honest truth. However, they never did buy a manual IS250, and neither did any of the customers (a high percentage of who were women that wanted the car to drive to work, not back-roads blasts). This year, Lexus finally killed off the stick shifts due to lack of buyer interest and the company no longer offers a passenger car with a manual transmission. Now you might think this is an obscure example, but the truth is that even cars like the Porsche 911, a true driver’s car if ever there was one, sell more automatics than manuals. Many supercars, including Ferraris and other legendary brands, no longer offer manuals in their fastest cars. There are a couple of reasons why the stick shifts are going away in fast cars. The first reason is they are slower. Porsche, BMW, Audi, and others now have dual-clutch automatics that continue to feed power to the car, and keep accelerating it, while shifts occur. That isn’t new. Automatics with older, torque converter technology could do that to a lesser degree. The big difference is the quickness of the gear change. Upshifts are now measure in milliseconds instead of half-seconds. To real enthusiasts faster is always better. The second reason, and this is key, is that automatics like dual-clutch autos can also be manually shifted. This may seem confusing, but it isn’t. The transmissions can be shifted to “drive” like any automatic, but the driver can also select a mode that lets him shift the car when he so chooses. Even better, those shifts are perfect every single time. And fast. The up shifts are much faster than a manual transmission car. The downshifts are also faster, but more importantly, they are also perfect every time. In the past, to perfectly downshift a manual, stick-shift transmission while braking, the driver had to apply the gas at the same time. That requires three feet since the brake, clutch, and gas are all being applied simultaneously. (see accompanying article). There is a trick to this that takes much skill and constant practice. It is called Heel-toe shifting. The driver uses his right foot to both brake and also provide gas, while his left is working the clutch – oh, and he is also steering with one hand and shifting with the other. Done right, there is nothing that can compare in terms of car control. Done wrong and the feeling is that of almost falling down stairs and narrowly catching one’s self. 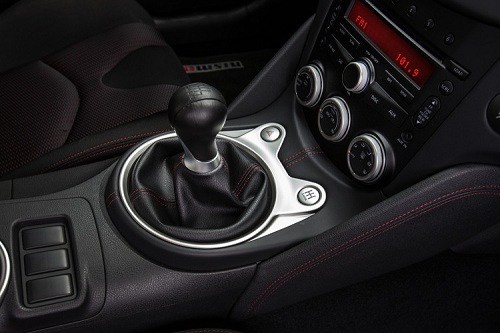 In order to provide many of the benefits of manual shifting including a clutch, but without the issue of matching the revs while braking and cornering, Nissan introduced an automated system on the 370Z a few years back. Importantly, there is a button to over-ride the system so that a driver can decide when he wants to match revs himself. The system works well. Both Porsche and GM now have a version of this technology. Rather than seeing this a threat to the existence of the stick shift, enthusiasts should see it for what it really might be – the savoir of the stick shift. Another thoughtful piece, John, but I have to disagree with your point that: "Although the cars are not made faster by having a stick shift, the constant rowing of gears distracts some from the fact they are driving a slow car." For many years (1960s-70s), my wife and I drove MGs (As, Bs and B-GTs), which had small-displacement, relatively underpowered engines. But because they had manual shifters, we were able to extract maximum performance in both everyday and competitive driving. Cars of that time that matched automatics with similarly small engines were woefully underpowered, mainly because their shift programs could not keep pace with acceleration demand. Being able to manually downshift when a boost was needed, instead of after it was needed - such as when entering a turn - made all the difference in maintaining acceleration. You have added some excellent perspective. In fact, I had a 1979 Supra that fits the description to a T. That car was great as a stick, but would have been a dog with the manual. Thanks for your comments. Thank you for explaining double clutch automatics. I had been very confused by this in an article about the Dodge Dart... which is okay, since I wouldn't waste funds on such a car anyhow, but I was still confused!